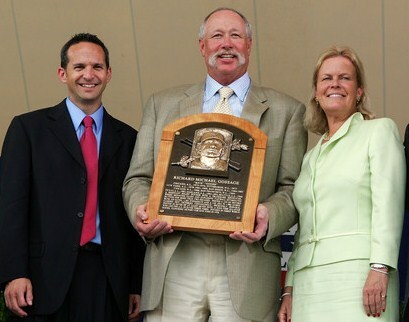 HOF President Jeff Idelson (left) and Chairman, Jane Forbes Clark have never issued personal statements regarding the Cooperstown thefts. The National Baseball Hall of Fame in Cooperstown, New York, is no stranger to thefts and obfuscations. Back in 1972, six baseballs donated by Hall of Famer Walter Johnson’s kin, featuring autographs of U.S. Presidents dating back to Teddy Roosevelt, were secreted out of a museum display case. The Hall of Fame never told the Johnson family about it until 1977, and only because Johnson’s relative, Hank Thomas, had asked to see the famous baseballs. In late 1982, Hall of Fame historian Cliff Kachline, discovered that vintage World Series programs loaned to Baseball Commissioner Bowie Kuhn’s office in 1973 were being offered for sale to collectors by MLB employee, Joe Reichler. The sales of Hall property gave rise to a Sporting News feature story and a headline in the New York Post that read: SCANDAL HITS BASEBALL HALL OF FAME. When Kachline was interviewed by MLB’s head of security, he told The Sporting News that MLB‘s investigator, “seemed to be more interested in finding out how The Sporting News got the story of the missing programs than he was in actually finding the missing programs.” On October 29, 1982, the Hall of Fame fired Cliff Kachline. In 1988, New York City auctioneer, Josh Evans, discovered that a signed photo he’d purchased from dealer Mike Gutierrez for $700 had a Hall of Fame accession number on its reverse that had been covered with wite-out. Evans reported the incident and returned the photo to Cooperstown, where head librarian Tom Heitz lobbied for a full investigation and the involvement of the FBI. Evans was interviewed by FBI agents who came to his NYC office and Gutierrez was investigated as a suspect because of his sale of the Ruth photo. The FBI learned that Gutierrez had spent considerable time researching in the National Baseball Library during the mid-1980s. Now, twenty-three years later in 2011, a letter addressed to August Herrmann from Cardinal owner Sam Breadon surfaced in a sale conducted by Clean Sweep Auctions in Long Island. Over the years, letters addressed to Herrmann had surfaced in other auctions, but as one veteran collector states, “with the suspicions that they were stolen from the Hall, those Herrmann letters are toxic.” Haulsofshame.com notified the Hall of Fame and the auction house to inform them we believed the document had been stolen from the National Baseball Library and also noted that Clean Sweep had sold three other letters addressed to Herrmann in a 2009 sale. Recently, reports published in 2010 by Haulsofshame.com uncovered the sales of four rare photos of Hall of Famers Mickey Welch, Christy Mathewson, Nap Lajoie and Jake Beckley. All of the photos had Hall of Fame ownership marks and accession numbers. The accession number on the Mathewson photo (which sold for $12,000 in a 2008 auction) was covered with wite-out. Other reports identified letters addressed to Herrmann that were consigned to sales at Heritage Auction Galleries of Dallas, Texas. In each instance Heritage withdrew the Herrmann letters from their sales. Horn’s statement that the Hall of Fame could not be sure the letter was theirs is even more problematic on account that Verkman and his consignor could not provide provenance for the letter before 2005. Verkman told us his consignor purchased the letter at auction in 2005, “as part of a very well known collection in the Midwest.” When asked to give details as to what auction sold the letter, Verkman declined further comment. Based on the well-documented items already verified as stolen from the Hall’s collection, one would think the institution would have pressed harder to learn if there is some other legitimate source of Herrmann correspondence other than their own collection. All reports from the time of the donation in 1960 indicate that the Hall of Fame received the entire holdings of the Cincinnati Reds and Herrmann spanning from 1902 to the late 1920s. When historian Dr. Harold Seymour cited the Herrmann Papers in the 1971 classic, Baseball: The Golden Age, his only source was the collection at the Hall of Fame. If there ever was a legitimate source for additional Herrmann correspondence, it has never been verified. The original donation of the August Herrmann Papers archive was reported in The Sporting News in 1960. 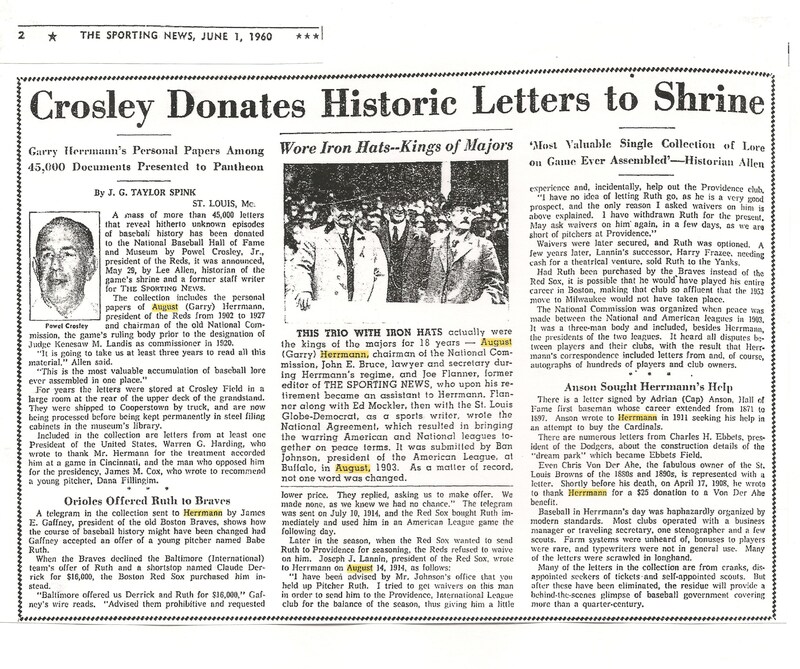 The donation, made by Reds owner Powel Crosley Jr., included "45,000" documents including letters, telegrams, financial records, contracts and other documents related to the business of baseball. On February 2nd, with the Hall of Fame’s blessing, the Breadon letter to Herrmann sold for $360. 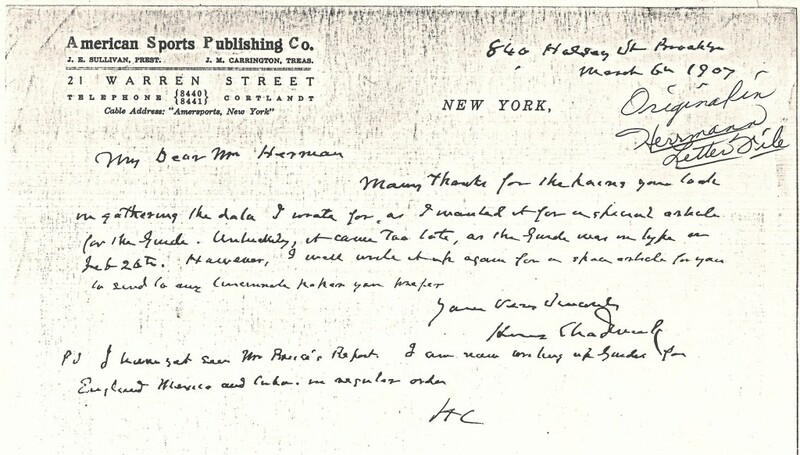 When we contacted the Hall of Fame to respond to SteveVerkman’s statements and the sale of the letter, museum spokesperson Brad Horn replied, “No comment.” In addition, the Hall of Fame did not fulfill our requests for a copy of the entire contents found in the Herrmann archive file dedicated to Sam Breadon letters dated from 1920 to 1926. That group of documents would show that the letter in Clean Sweep was part of a series of letters to Herrmann found in “Box 51, Folder 5″ of the Hall of Fame collection. Sources indicate that the Hall of Fame has never conducted their own thorough investigation into the thefts from the National Baseball Library. In regard to the Herrmann Papers, they have never even examined the thousands of research notes compiled by Dr. Harold Seymour and Dorothy Seymour Mills when they used the Herrmann archive in the 1960s. Their original notes, quoting directly from 1000s of Herrmann letters, are housed in the Rare and Manuscript Collection of Cornell University. The Hall never properly catalogued the collection of over 45,000 documents until 2005, so the Seymour Papers at Cornell are the best documentation of what should be in the collection. However, Hall of Fame officials have never attempted to view those documents. In addition, the leadership at Cooperstown has halted previous investigations, failed to prosecute crimes and currently has failed to engage law enforcement for recovery of the stolen property they were entrusted by donors to protect and preserve. In regard to the Herrmann Papers archive, the Hall of Fame is also aware of documentation that proves the collection was compromised. Yet they allowed the sale of the suspect Breadon-Herrmann document saying they can’t “unequivocally state” it was stolen. This letter from Henry Chadwick to August Herrmann was part of the HOF's "Herrmann Papers Collection." This letter was documented on a National Baseball Library photocopy found in Chadwick's file. The photocopy notes that the "original" is located in the "Herrmann File." Hall of Fame officials cannot locate the letter. In failing to properly investigate the crimes committed in Cooperstown and in failing to actively pursue recovery of stolen and suspected stolen items from their collections, the Hall of Fame appears complicit in the crimes through their negligence. Haulsofshame.com has also been made aware of instances where donors and relatives of Hall of Famers have been told by museum and library officials that their donated items could not be located in the collection. The items wrongfully removed and sold from the Hall of Fame in the 1982 Reichler scandal were valued in the tens of thousands of dollars. However, the items stolen from the National Basbeall Library in the late 1980’s, including those from the Herrmann Papers archive, are estimated to be valued in excess of $1 million. Maybe the new Attorney General of New York State, Eric T. Schneiderman, needs to lay down the law for Hall of Fame Chairman Jane Forbes Clark. Recently, Haulsofshame.com also made Hall of Fame officials aware of the sales of letters addressed to Hall of Fame presidents and executives including Clark’s grandfather, Stephen C. Clark, the Hall of Fame’s founder. We asked Hall officials if the Clark family or the families of other museum executives could have sold off their official correspondence, including a 1948 letter from Ty Cobb to Stephen C. Clark. We also asked if such correspondence was missing from the collection. The Hall of Fame did not reply. Keeping mum is HOF policy… and the lack of media pressure isn’t helping. I am curious if there is a list of donated items that the Hall of Fame has deaccessioned in the past or if they are currently doing this? I know museums do this to raise funds or to dispose of items they no longer want to keep in their collections. But if it is a regular occurance, it should bother those who donate items to any museum. I have seen it happen first hand. The Hall of Fame relies solely on donations for their collection. I don’t believe they have ever deaccessioned any items in the past. Alexander Cleland, one of the HOF’s first organizers/officials, kept his papers and correspondence from the time of the HOF’s inception (c1934) until his retirement in 1941. His papers from 1934–1941 were sold by his family in the 1990s. Those are the only HOF related documents we know of that are on the market legitimately. i think the heirs of the donated heirlooms should file a lawsuit, this story needs to be told and rectified. Wouldn’t the best course of action for the HOF be to admiit what happened long ago and pursue recovery of every single item at all costs? Hard to believe this could happen. The way things are unraveling,it is appearing that the HOF and Halper, etc. were as thick as thieves and really screwed the public for many years.How many more items are going to be uncovered as stolen of forged in the HOF. ?My suggestion is , close it down and stop taking the fans $ to look at phony stuff, or no stuff at all, cause it walked out the doors. Another good one. Thanks for reporting the stories SCD is too chicken to tell us about. 1.The HOF got a donation of 45,000 of August Herrmann’s Papers in 1960. 2.A guy is investigated for selling stuff stolen from the HOF, and was one of the only people to have access to Herrmann’s Papers before 1990. 4. Letters to Aug Herrmann show up at auction with no provenance whatsoever. 5. The HOF say’s they can’t determine if the Herrmann letters being sold were stolen from them. Nothing sounds fishy here, why look into it any further? The HOF’s doing a great job. Just like Bernie did for me. I don’t follow the Hall of Fame’s reasoning that going after a thief is negative PR. They know who perpetrated the crime, he’s still out there working in the baseball memorabilia business, and these letters continue to pop up for sale. Seems to me the message the Hall is sending is that it’s okay to steal from them. It is amazing how a major auction house and the HOF are just looking the other way when the story is right out in front of their noses. No of course they would not. The HOF under these two have been subject to open questioning of their leadership. The more that these events come to light, the more that their so-called leadership should be questioned. Having worked for the HOF back in the mid-1990’s, I know for a fact that the future of the HOF is not well served by either of these two individuals. Their silence over these latest findings by HOS only confirms what I knew years ago. The game is not well served by either of these two.